Well, here is some compelling proof that anti-Trump bias is alive and well. Since taking office, President Trump has spent nearly every weekend away from the White House, and his detractors have wasted no time in slamming him for it. But while Trump is being painted as lazy and incompetent because of his weekly getaways, it seems as though people are completely ignoring the fact that President Obama hasn’t even stepped foot in the White House in over eight weeks. Yep. The outrage about Trump’s traveling seems unbalanced to say the least. People have been bashing Trump for his frequent trips to Mar-a-Lago, saying that the new president should be in Washington so he can focus on policy. 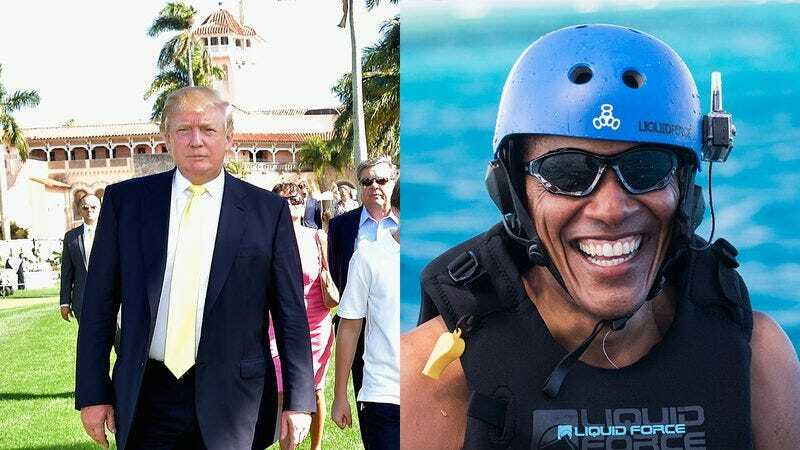 Meanwhile, there’s been no criticism of Obama completely falling off the grid, only surfacing through viral photos of himself windsurfing with Richard Branson. If that blatant contradiction doesn’t get your blood boiling, this infuriating fact will: Not a single news article about President Obama’s luxurious British Virgin Islands vacation has mentioned the fact that President Obama hasn’t met with his cabinet or signed a bill into law in nearly two months. For the public to be throwing shade at President Trump, the guy that we know is in D.C. for at least a few days every week, while giving Obama a pass after he disappears for two months to a tropical paradise is a complete double standard. It is public knowledge that Obama is no longer getting national security briefings, and yet no one is picking up the story. And in case you think Obama was in the British Virgin Islands on a diplomatic trip, think again: A list of official presidential state visits on Whitehouse.gov makes absolutely zero mention of it. Wow, Obama. Seems like you’re too busy catching some rays or refuting claims that you wiretapped Trump Tower to return to Washington and get any real work done. Whether or not you think a president should be taking any vacations at all is beside the point. The point is that if Trump is going to continue to get flack about traveling to Florida and golfing with his friends every weekend, Obama should catch at least that much heat for going completely missing for the last eight weeks.